To understand someone effectively, you have to listen on two levels. You listen to what they are saying, and you must listen at the heart level. There are two reasons you want to do this. You want the person who is talking to you to experience your care through active listening. You want to help the person by listening beyond what they are saying: you want to hear their presuppositions, motives, and thoughts (Hebrews 4:12-13). You hope to discern what the Lord knows (John 2:24-25) and to perceive what the Lord understands, which is why they come to you for advice (Hebrews 4:12-13). They not only want you to tell them what they do not know, but they want you to give them a scripted and practical plan that will lead them through their situational difficulties. Their desire means you must think more deeply and broadly than what the person who is talking to you knows already. You must know more about their problem than they do because they will never be able to tell you all about their problems. I suppose if they could tell you about all the intricacies of the issues at hand, they would not need your advice. When they come to you, they tell you what has been going on in their world. The individual is seeking help for what has been happening in their day-to-day life. The behaviors and drama they lay out for you are always secondary and symptomatic of the fundamental and foundational problems of their lives. This perspective is hugely important for us, as disciplers, to understand. We want to be useful friends, and to be this kind of friend we must learn how to listen on two levels. Let me illustrate. Mable had married Biff seven years ago. Their marriage has been in the toilet for most of those years. Biff is a passive husband, and Mable expects Biff to be a different type of husband. As you might imagine from this brief descriptor, their marriage is bound for hard times. Mable is opinionated and generally views herself as right and Biff does not know how to lead her. Because of these issues, he takes a passive role in the marriage. He acts out his anger through silence, and she acts out her frustrations by speaking her mind. It is two people with the same sin pattern, only acted out differently. Both of them are angry and feel justified in their sin. They end up in counseling. When they came to counseling, Mable did most of the talking. What she did would be better described as venting. Mable gave me a long list of how Biff has failed as a husband. She was mostly right. Occasionally, Biff would chime in to let me know how Mable has been a self-righteous nag. At the end of our time together, I had a clear picture of Biff’s badness–according to Mable. I also had a clear view of Mable’s badness–according to Biff. There was no question they could clearly articulate the other person’s sin. They told me story after story after story after story after story–ad nausea. As they were talking, I was actively and intentionally listening to them. I wanted to understand what they were saying clearly. Interestingly, what they did not realize was how I was listening and on what level I was interpreting their words. I was actively hearing what they were saying, and I was also discerning what they were not communicating, which is what I mean by two level listening. If I only listened to what they were saying on the behavioral level, I would have been as lost and hopeless as they were. I would have become a referee or negotiator, trying to figure out how two people could tell the same story so differently. Sorting out their truth claims would be like a dog chasing his tail, which would not serve them or me. Even if I could find the truth in their competing stories, it would mean one was right, and the other was wrong. That is not the right place for either one of them to be–unless being right was all that mattered. Sometimes winning is all some couples care about accomplishing. They have a short-sighted vision of marriage. If winning an argument is all that matters, the relationship is destined for continual dysfunction and possible divorce. It is like two beggars squabbling over the seven cents they found on the sidewalk. They cannot agree on who gets four or who gets three. Both of them are selfish and self-seeking. Neither one has a higher vision than the seven pennies before them. Biff and Mable were not seeking God. They were seeking self-vindication because they were legitimately hurt and saw themselves deserving something more than what they were receiving from each other. This problem happens with any married couple that forgets the gospel. Ignoring the reality that we deserve hell is perilous for the mind and the marriage. Mable and Biff have forgotten where God found them. It is like spoiled rich kids, who have everything they could ever need, but they still want more. While they were venting, I was thinking about a more gospel-centered worldview, hoping I could bring the gospel to fruition in their hearts. I was thinking beyond sorting out their stories. Their stories were symptomatic, not causal. The main thing their stories told me was their lack of trust in God. They were believers who functioned as atheists. Their frustration and fear were a clear testimony of how God was not controlling their hearts in their situational difficulty. Mable was angry at Biff, and he was mad at her. In James, we know the core of this kind of problem. He says the angry person is that way because he is not getting what he wants. This problem makes him an idolater, which is why Biff uses anger, albeit the silent treatment, as a means to get his desires satisfied (James 4:1-3). Biff and Mable were choosing godless means to satisfy their desires. Therefore, they vented story after story to get me on each other’s side–to get me to see it the “right” way. They assumed by telling me how wrong the other person was I would be convinced one was right and the other was wrong. Their posturing revealed more about their hearts than their rightness. I perceived bitterness, anger, fear, revenge, and a lack of trust in God. They would probably be surprised to know these things–at least initially. This predicament is where the counselor must be careful. People who are sinfully venting about how bad someone has treated them are not ready to see their sinful hearts. This puzzle is the dilemma of the sinful-victim, a problem for sure. Typically, we are all guilty to some degree in our relationships. While I could not change either one of them, I hoped to care for them so they could improve–beginning in their hearts. This desire is one of the reasons I wanted to listen to their stories. I tried to empathize, hear, and understand. The primary goal was to be clear in what they were saying while knowing how I would not be serving either one of them if I did not bring gospel-clarity to both levels. This listening and responding needs courage. Too often it is one of the missing pieces in the discipleship process. A person will listen to the stories and empathize, but not move the person any closer to the Savior by rooting out the heart idolatries. The hurting person may feel heard, but you will not help them because you did not address their role in the demise of the relationship. Sometimes the sinning-victim will say you did help because you merely listened. They are correct to a degree, but if all they wanted was a listening ear, they have short-changed themselves on all God could do in their lives. Each situational difficulty is an opportunity to change and grow. The careful discipler wants to listen and respond to both levels of a person’s life. The infographic describes how to discern at two levels. It is a rendition from a counseling situation. 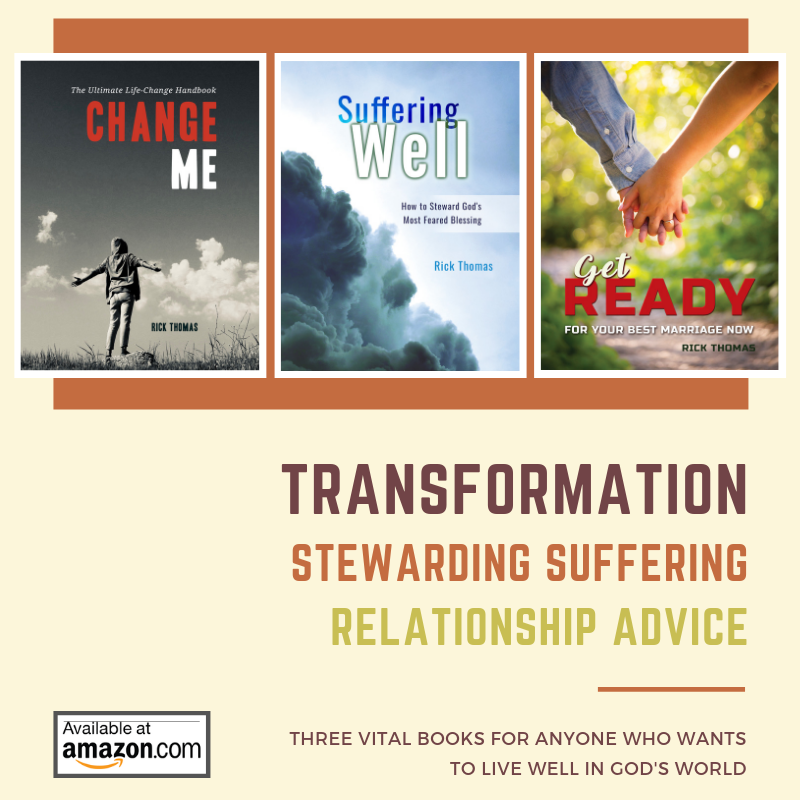 I sat and listened to a friend tell me several stories about what was wrong in his marriage. I did not refute anything he said. As far as I was concerned, he was telling the truth. His wife had done some horrible things to him, and she was proceeding to drag his name, the church’s name, and God’s name through the mud. As I was listening to him, I was asking the Lord how I could help him. He was not only telling me what was wrong in his marriage, but he was venting too. I continued to ask him questions, not to learn more information about his relationship with his wife, but to discern the theological breakdown in his heart. The more my friend talked, the more I was learning the real person (Matthew 12:34). His words allowed me to attach biblical labels to the things he was saying. (Look at the heart in the graphic.) It was clear by his attitude, words, venting, stories, and frustration how he was not under the control of the Lord. The primary things he was saying from his heart were along the lines of anger, fear, and unbelief. His stories told me he was not getting what he wanted and he was frustrated (angry) about it. James called this the war within (James 4:2). Warfare was happening on the inside, and it was incumbent upon me to draw attention to it. To merely listen at a surface level would not help my friend. I began to address his heart, specifically the anger. Sinful anger always associates itself with fear. Anger is a manipulative tactic of the fearful person to regain control of his life or to get his way. This perspective is another way of saying my friend was not trusting God. He was functioning in unbelief. Biff’s functional god was his wife. She had full control of him. Whenever you become sinfully angry at another person, the person you are mad at owns you. They control you because they have something you want. Mable was not giving him what he craved, and he was mad about it. He had an un-cooperating god on his hands, and he was venting. If Biff rested in the Lord alone, he would not be venting; the drama would be different. He would be trusting. Even the way he shared his story would be markedly different if God were genuinely ruling his heart. Whoever or whatever rules you will control the words you choose to describe your life. He was not acting like a man under the control of God Almighty. His word choices were making this clear. God has promised to take care of us (Psalm 55:22). He has assured us how no person is more significant than Him (John 10:29). He said He would complete in us what He began in us (Philippians 1:6). He appealed to us not to worry about what people can do to us, but to trust Him (Matthew 10:28). He has given us the promise of victory, and He has appealed to us not to fear or doubt His active goodness in our lives (Matthew 6:25-34; Luke 11:11-13). We have ultimate victory through Jesus Christ our Lord (1 Corinthians 15:57). My friend lost his Godward focus. He was venting about all that was wrong in his marriage, while not fully trusting in the One who is higher than all. Can you see how important it is to listen on two levels? By all means, let your friends share their stories (drama) with you. But lend your ear to how they share their stories and what they are saying about their real selves and their God so you can reorient their minds to the story that He is writing in their lives. You want to empathize with them, but your primary goal is to lead them to functional heart change. « Did You Know There Is a Better Way to Do Counseling?